for quality as easy as 1, 2, 3. ​Automation to improve documentation and pay for quality. One login, One click, One consolidated list of gaps in care for all conditions. As clinicians open the patient chart, CareSentry scans chart data for care gaps and presents them REAL TIME in one list. "Care Sentry's quick glance, traffic light modeled dash-board offers practitioners the opportunity to complete action items on every patient, every time, thereby improving clinical care, achieving meaningful use criteria, and allowing a practice to set standards of care for specific patient groups and for chronic disease management." The identification of patient populations has never been easier. Set up the registry parameters once, and CareSentry will find patients by matching chart data to registry parameters. It then automatically adds qualifying patients each day into the registry. No more running reports to find all your diabetics, hypertensive patients. CareSentry will do it for you with no staff required, and then CareSentry monitors chart data to find care that is due. 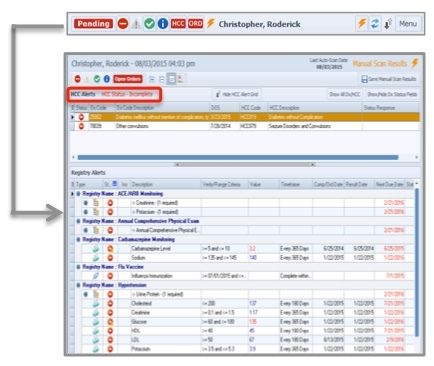 Maximize patient visits by having quick access to what is due during the visit. As each user/provider opens a patients chart in the EHR, CareSentry scans chart data against registry metrics and identify care gaps. These gaps are presented REAL TIME. Care assignments happen automatically presenting each person with the gaps they are responsible for. No more manual tasking of care. Move past poking around EHR screens to find gaps in care. Once patient registries have been defined, the monitoring criteria is defined - meaning all the care recommended for patients with that condition. Whether it be two or 15 parameters to monitor, CareSentry automatically scans chart data to see if care has been provided and presents gaps in care REAL TIME at the point of care during the patient visit. CareSentry provides management with data on each provider, what visits they received the alerts on and whether or not the care was addressed on that visit. It provides detailed reporting on compliance with registry metrics.